After a long week of anticipation and excitement, the weekend finally came. Chris and I headed to Surf Side with the new Lost Boys Trailer in tow to meet up with Josh, Justin and Chad to begin a long weekend of camping and fishing. With the water not looking optimal, we knew we were in for some hard fishing. Luckily we had some good catches and made some good memories that made the trip worthwhile. We arrived on the beach Friday afternoon around 1 PM. Chris and I set up camp quickly. We unpacked the trailer, put up the rails on the trailer platform, got the rods rigged up, and set up camp. We even set out a crab trap just past the first sandbar in hopes of catching a feast for the evening. An hour later, Josh and Justin showed up, and we decided to get some shark baits kayaked out. 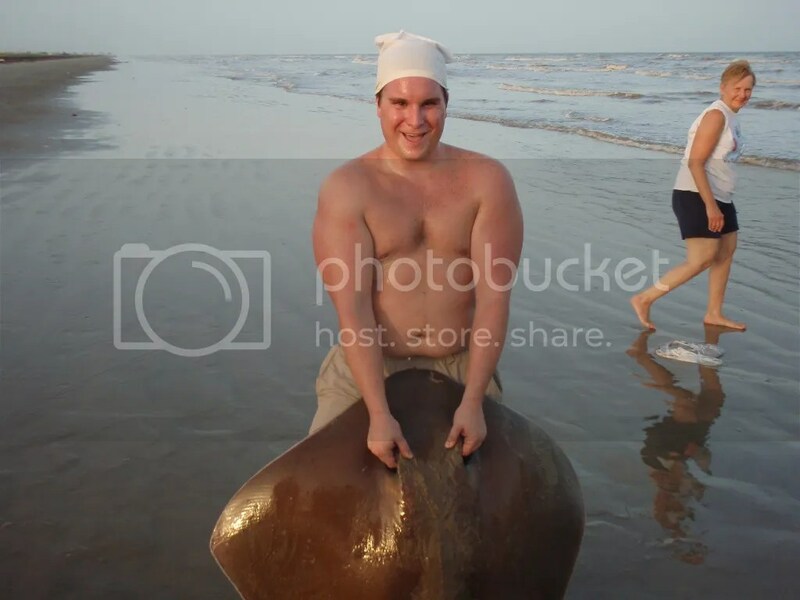 We started out by running Josh and Chris’ lines, both with large slabs of stingray. When it came time to bait my rod, we decided that it would be best to try a bait other than stingray on this rod. 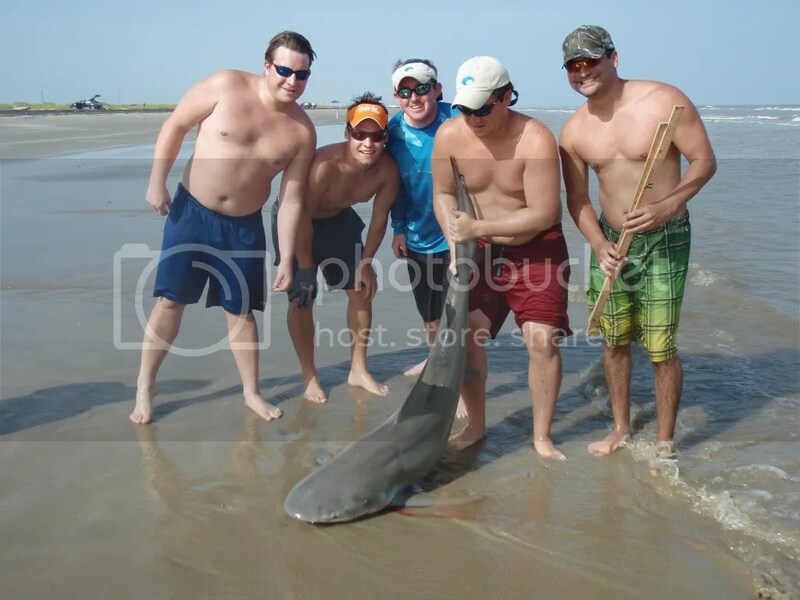 We all went to work trying to catch some fresh bait in the surf. We were all armed with sabiki rigs tipped with a little dead shrimp on each of the six hooks. We were having trouble catching anything except for hardheads. 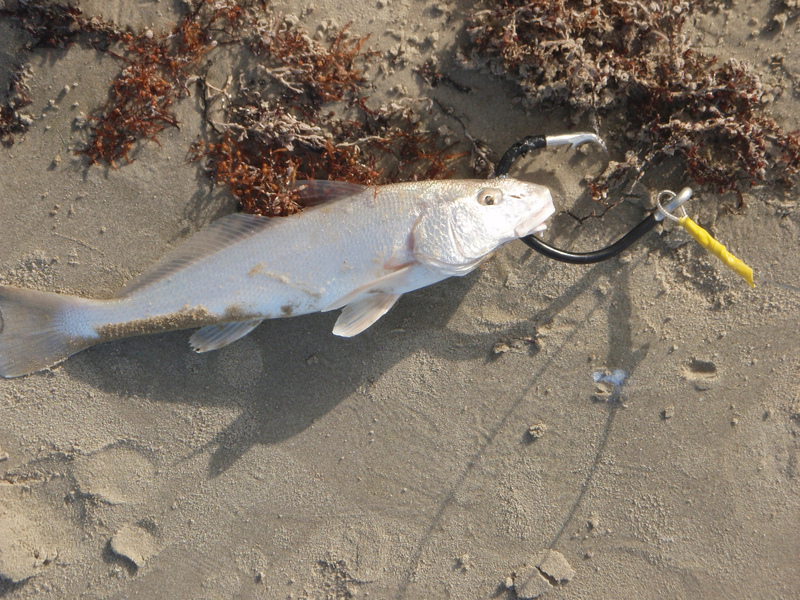 Finally, after what seemed like forever, we were able to catch a nice sized whiting that would make a nice bait. We got my rod ready, set up the leader, and hook on the whiting. 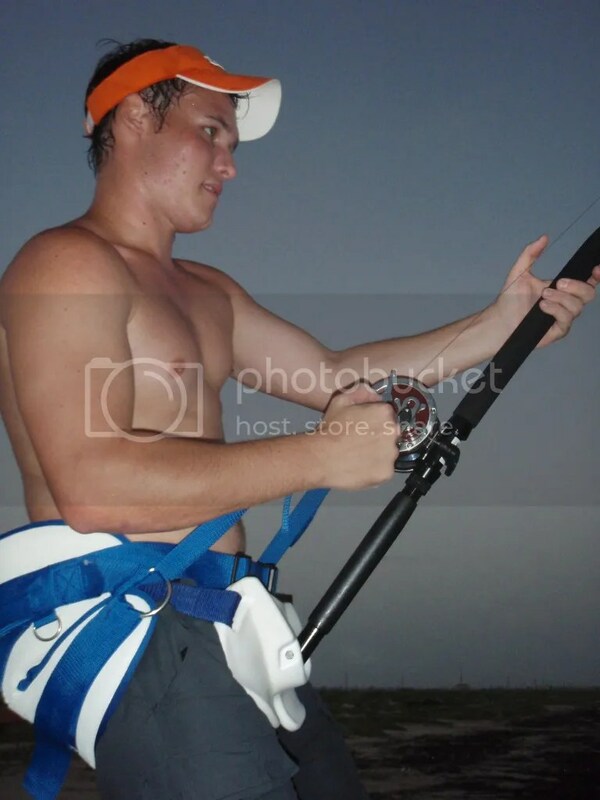 Justin volunteered to kayak the bait out while we got the rod set in the trailer. We now wait, which can be the hardest part of shark fishing, because doubt starts creeping in and you start to wonder: “Will the knots hold up?”, “Were these the right baits?”, and “Please for the love of Poseidon do not let us get weeded out!”. At that point evening was starting to creep up on us. As those last few hours arrived, when we had to make a choice to check our baits or hope there still there and will make it for the rest of the night, a tick sounded out. Heads snapped at the neck to see which rod just made the noise as the tick turned into a full on scream! The noise we love to hear! It was my rod getting blasted by something! I ran up to the trailer and flew up the ladder, onto the platform, with Chris on my heels. I picked up the rod and the fish was still taking short bursts and then a long burst. Then I heard Chris, “Tighten down the drag!” I slowly tightened down the star drag on my Penn Senator 4/0 to get the circle hook to find the corner of the fish’s mouth. Fish on! 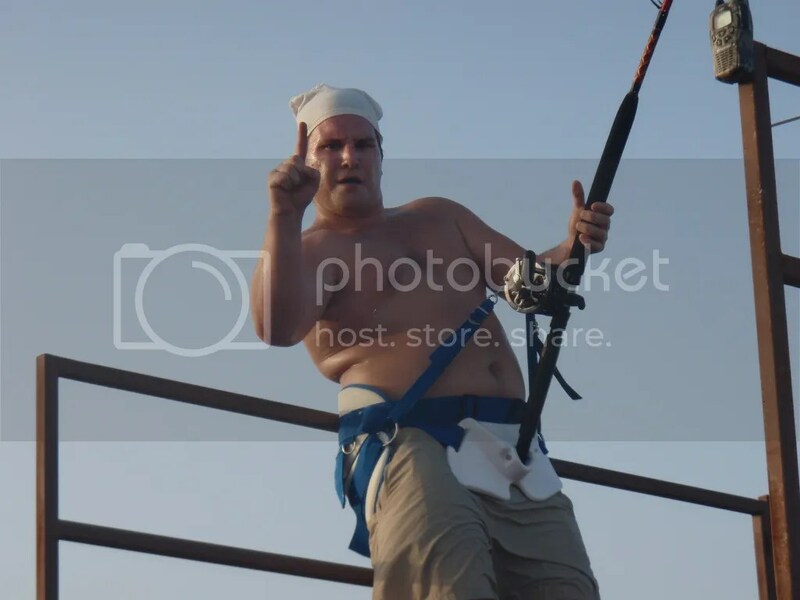 I heard Chris again say, “Lift your arms up!” As I did, I felt the harness wrap around my waist, the the clips jump in the rings on my reel, and the fighting plate get strapped on, all in one fluid motion. As I began reeling, the guessing game began. We were trying to figure out what was on the other end of this line. We all hoped for a shark over 7 ft. but the way it was fighting suggested another culprit. The fish would run then stop and I couldn’t move it. Then it would run again and I would gain a little ground on it and then it would stop completely. 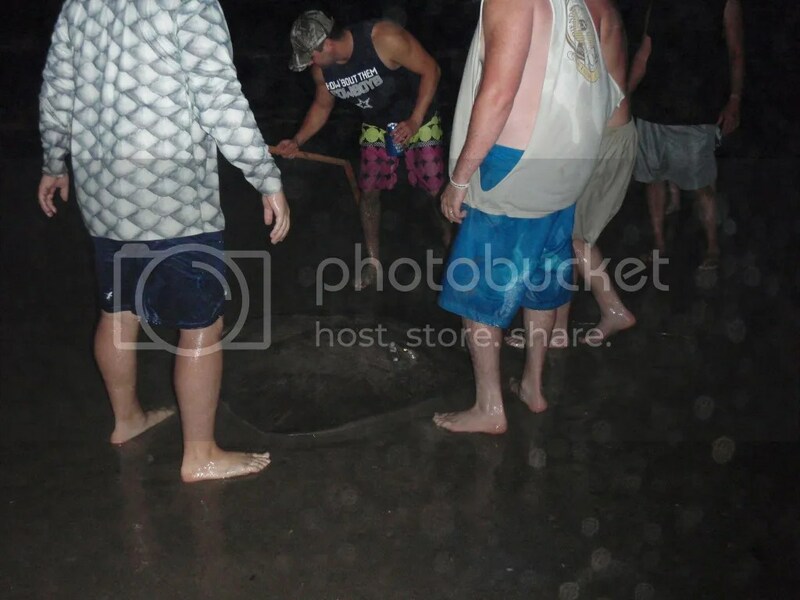 At this point we noticed two things: it was probably not a shark by the way that it was fighting and the crab trap that we set out by the 2nd sand bar is moving way too much, the was caught on it. We knew we had to get it off the crab trap as soon as possible or the line would break any minute, so Justin loaded into the kayak and paddled out to try and get the line free. 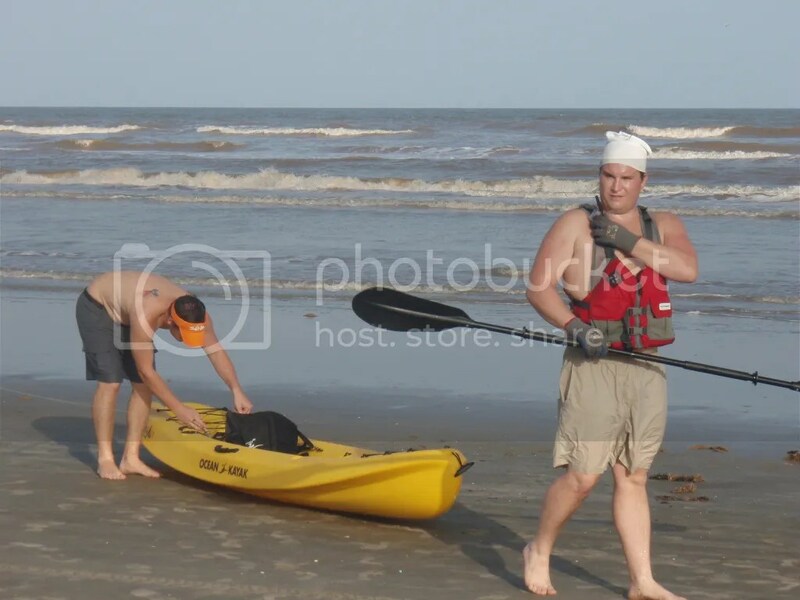 We watched as Justin kayaked back and forth trying to grab the trap while getting slammed by breaking waves. 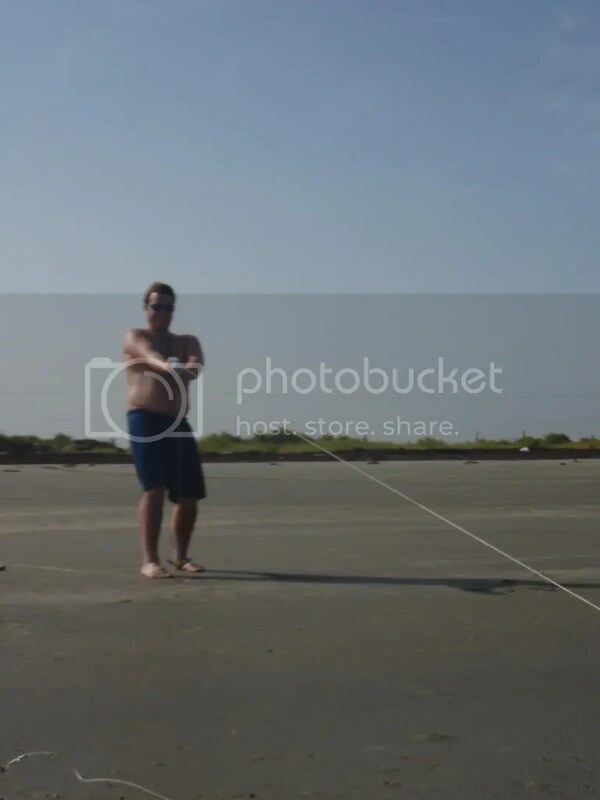 Just when we thought the ocean would get the best of him, he had a burst of energy and was finally able to grab the trap and get it untangled. As soon as it came free, the fish was mine! 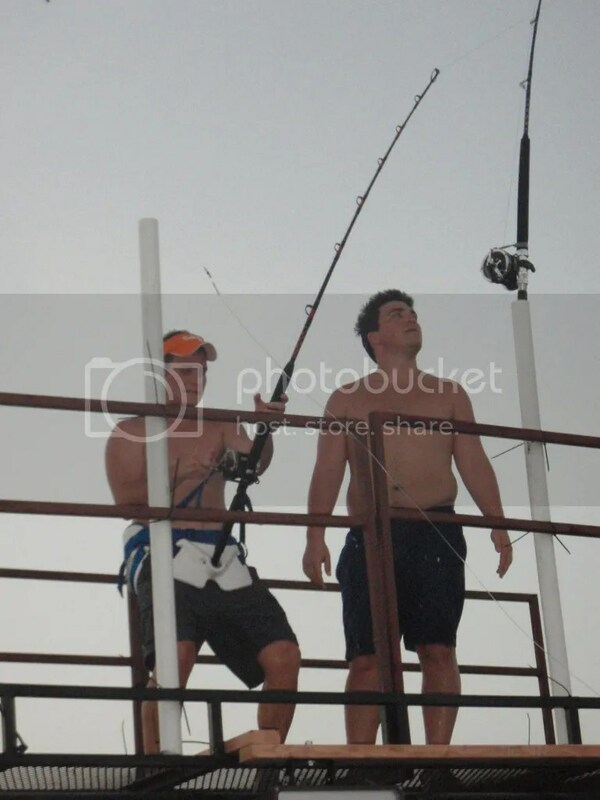 I reeled it in enough for Josh, Justin, and Chris to grab the leader. They began to pull it up on the beach when we finally saw the devilish flap of a stingray’s wings as it emerged from the chocolate brown surf. 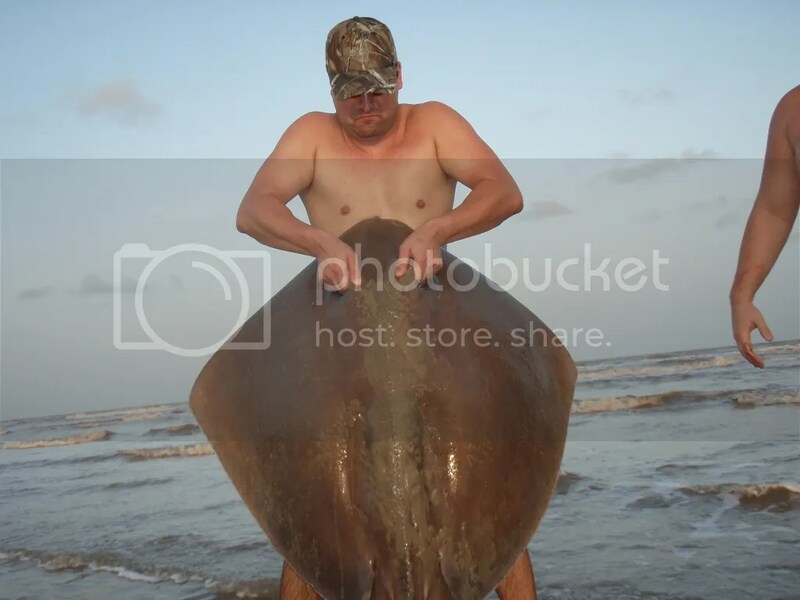 Another huge Southern Stingray! She measured out at 3’ 5”. 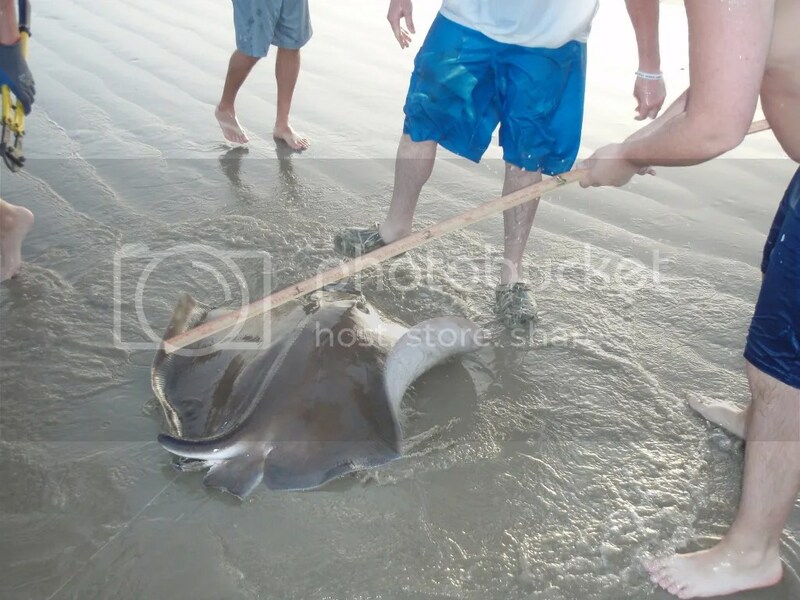 We got the ray pulled up on the beach, unhooked, measured, and made sure she was in good enough health to take pictures with. When we went to cut the barb off for safe handling, we found that the ray was missing its tail. 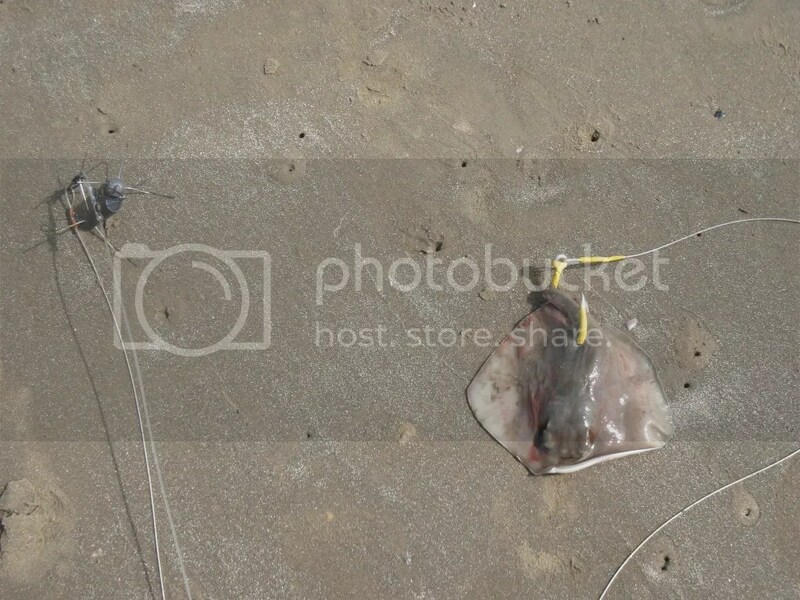 Most likely the ray had been caught before and a fisherman cut its tail off before releasing it. Fortunately, she survived that ordeal and seemed to be very healthy still. We each lifted her up to take pictures, and when Chad lifted it for his picture I heard an, “ewwwww! 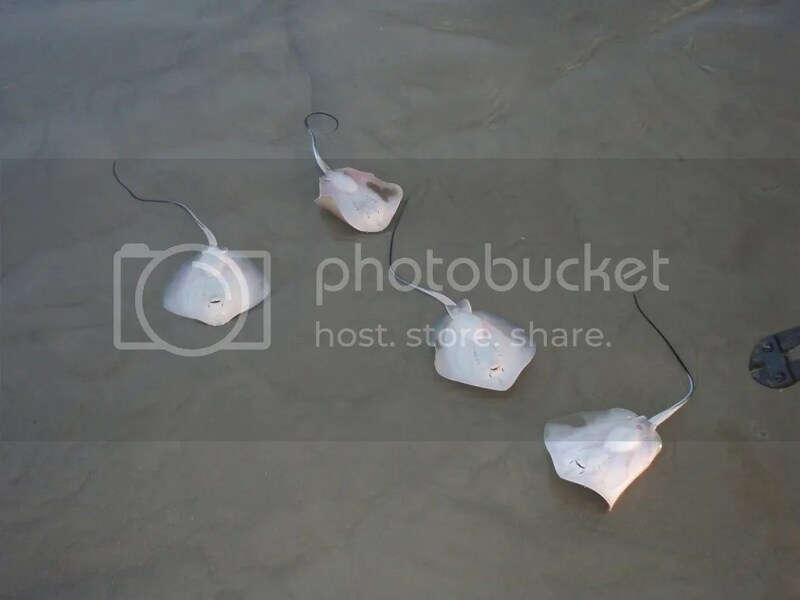 !” When I looked up baby stingrays surrounded Chad! The big female had given live birth to at least 7 salad plate sized baby ray! We let most go but decided to keep a few for bait for the shark rods. We released momma safely along with her babies to fight another day. The moment that the ray gave birth to seven babies! Baby rays. Stingrays do give live birth and these rays were already pretty big. We were pumped! We had one last whiting left and it was very small in comparison to the last one, but we hook it up and Justin runs it out on the same rod. While Justin is out there we decided Justin is getting the next run, he has been kayaking lines out and working his back side off, but he is the only one who hasn’t reeled something in. I kid you not when I say that by the time Justin got back, set the kayak down, and grabbed a drink of water the reel that he just put out makes that beautiful screaming sound that is music to our ears! We all started yelling, “Justin! It’s yours! Take it!” He did panic a little, but he ran up the ladder onto the platform with Chris at his back coaching him and getting him set up in all the gear so all he has to think about was reeling. He slowly tightened down the drag and the fight was on! We could tell that this fish was bigger than the last one right away. It was easily pulling drag from the locked down 4/0! Justin muscled down on this fish and gets it reeled up in a pretty good time. Something was telling us this was no shark. 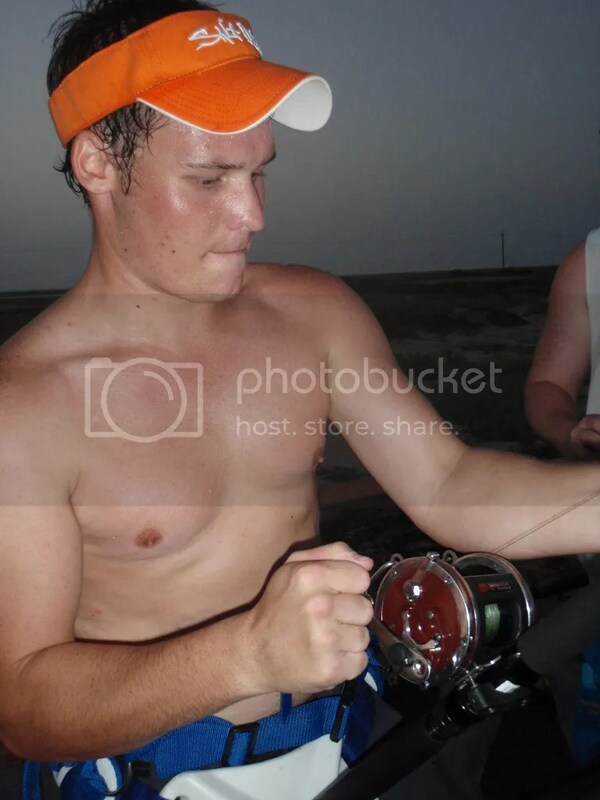 Justin couldn’t feel any head shakes and the fish would anchor down when it hit the sandbars. Again, Josh, Craig, and Chad leadered the fish. 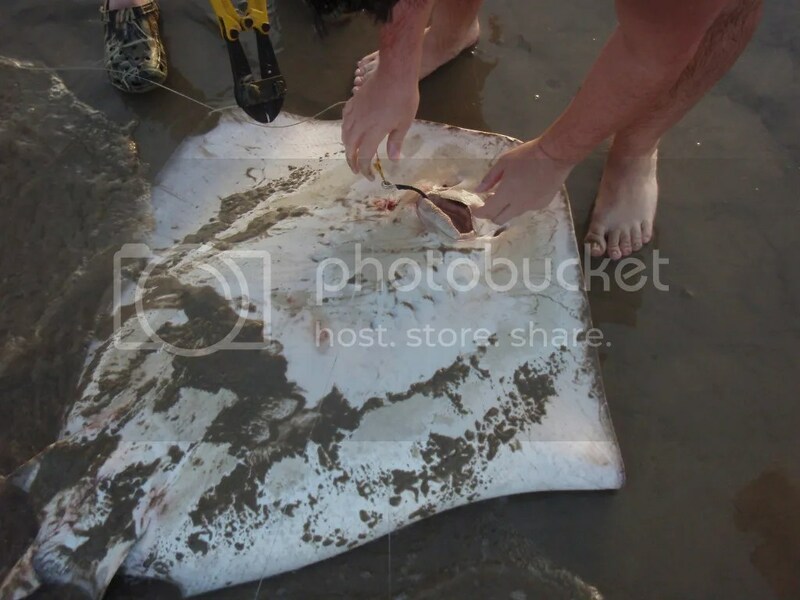 As the three of them worked together to pull the fish up on the beach we saw the water start to churn as a massive ray emerged. Another big Southern! We got it unhooked, measured it, made sure it was in good health, and got some pictures with it. 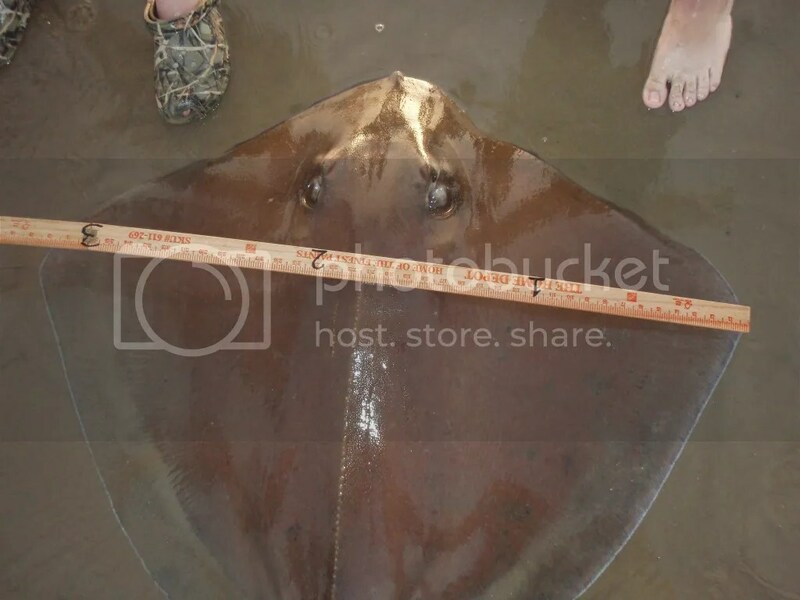 This ray was much bigger than the last one. It measured out to 4’11”; just shy of 5 feet. 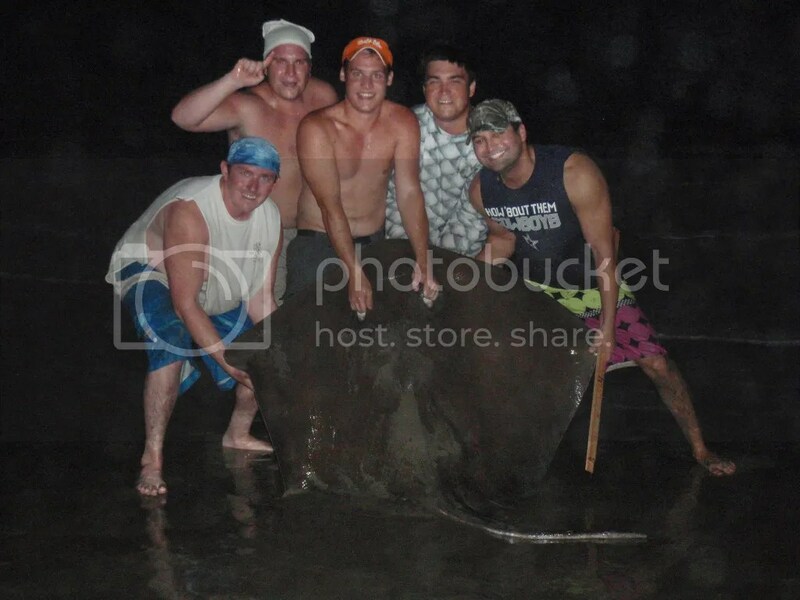 It was almost as big as the 5’6” ray that we caught the week before in the same area! We finally get the ray beached! 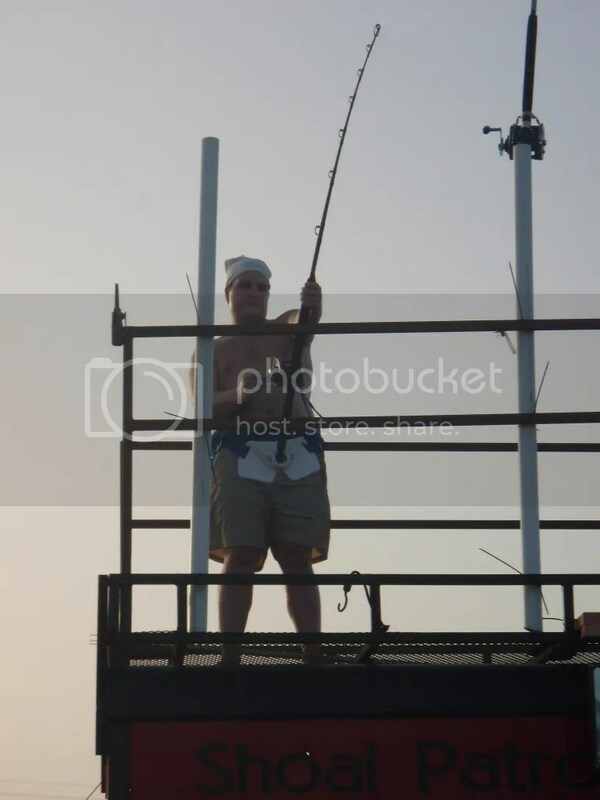 We were able to release both stingrays and watch them swim off, while putting on a pretty good show for the people who gathered around to see the Lost Boys at work. We waited the rest of the night for another run but nothing came. We left the big chunk of stingray out on the 9/0 all night while Chris slept up on the rack by the rods, but nothing. 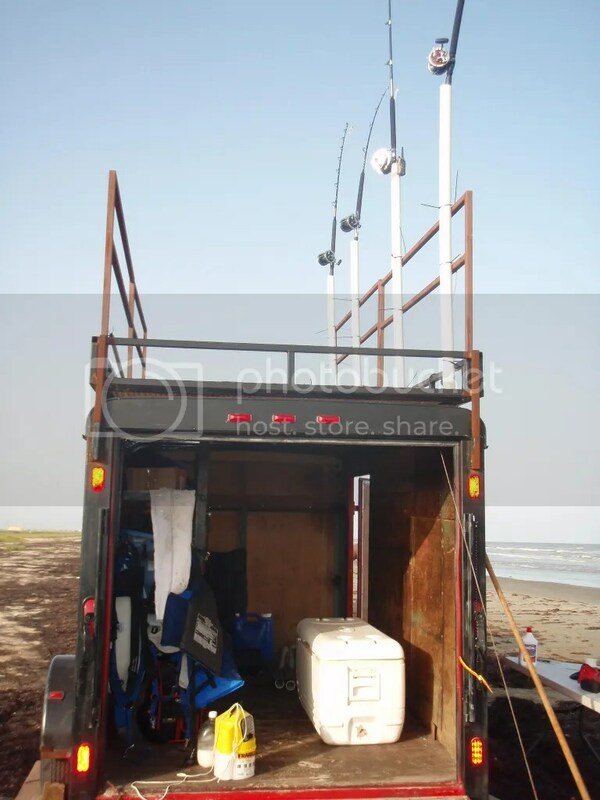 Saturday afternoon, the current was not as strong as it was the day before, but more people have come out to fish and instead of walking down the beach 50 yards to kayak baits at a 45 degree angle to camp, we had to pretty much go straight out and drop the lines. We decided to get some shark baits out in the early afternoon. We used a few different baits ranging from fresh mullet, fresh whiting, and fresh baby stingray. Chris and Josh each got out a couple good sized whiting while Justin took my line out with a baby ray. Right after mine gets dropped, before Justin even gets back from kayaking, the line goes limp, it had been cut. We re-rigged the rod, tried again, and once more it went limp just after it was dropped. Now the rod is done, it didn’t have enough fishing line left for me to take it out again. At this point several other of our lines had done the same thing. What had happened was the camp up-current from us had set up too close (50-75 yards) and was using huge baits (30 lb tuna heads) with weights way too small (two 8 oz spider weights) with a rough current coming our way. Their lines and tackle were getting tangled with ours and cutting us off. 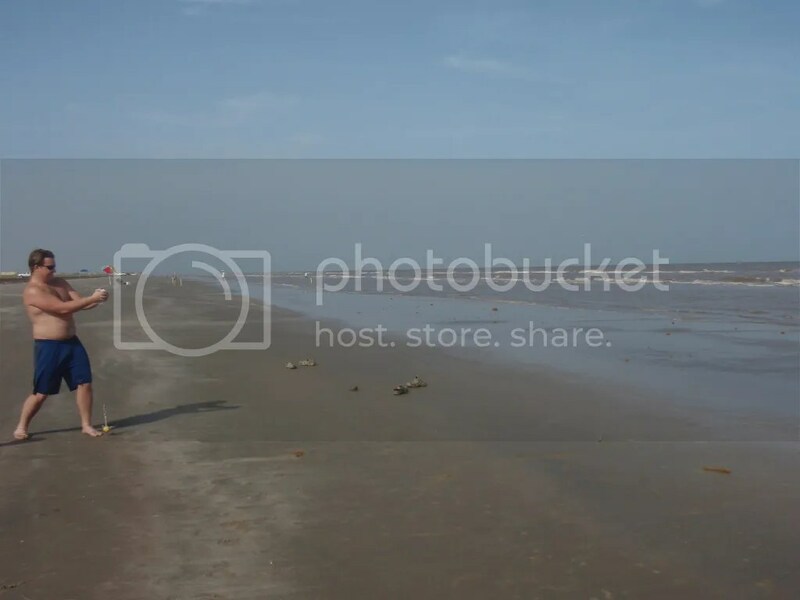 With the beach being crowed, you could feel each of us thinking that we were done for this trip. We didn’t have enough time before dark to get our entire camp moved and these guys were going to keep wiping out our lines. The guys down from us finally noticed that they were having problems with one of their rods, and I could see that there is a line tangled in the line that they are reeling in. I walked over and found that on their hook is a tangled mess of line that belonged to my rod that had been cut off. I was pretty happy to get my line back because that meant I could pull in my expensive tackle that is tied to the end! I began the arduous process of pulling in the 300 yards of line in by hand. I call for help because this line is really hard to pull in. It would pull in very easy then all of a sudden come to a stop. I thought that it was just the weight hitting the sand bar and getting stuck. Josh and Justin came to my aid and the three of us continued to pull in the line. After some time, I realized that I should be coming up on a leader soon, and as I look up to see where the line is I notice the line is moving back and forth. At the end of the line I see a fin! Finally a shark! 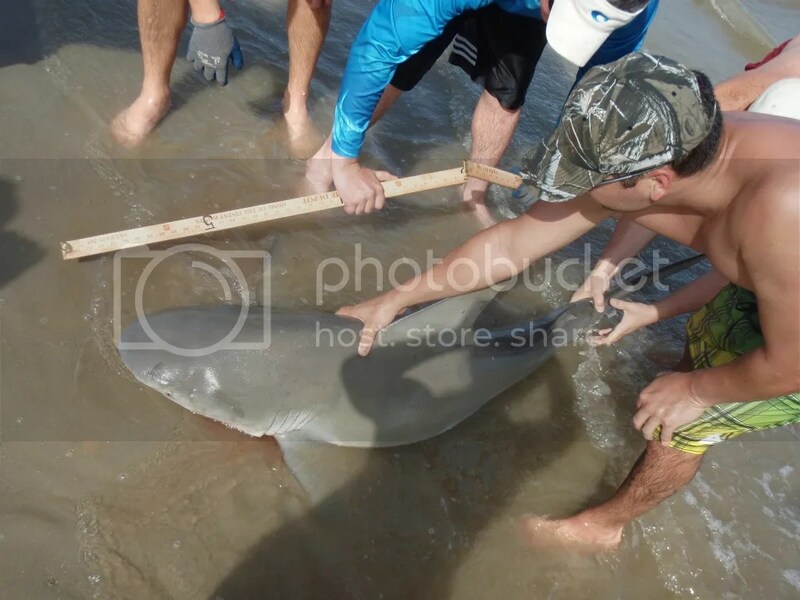 At first we thought it was a black tip shark when we saw the tail, but when its dorsal fin surfaced we realized that we had a nice sized bull shark! We had one problem though, she was exhausted and coming in on her side. This line was the first one that got cut off with the baby ray for bait. 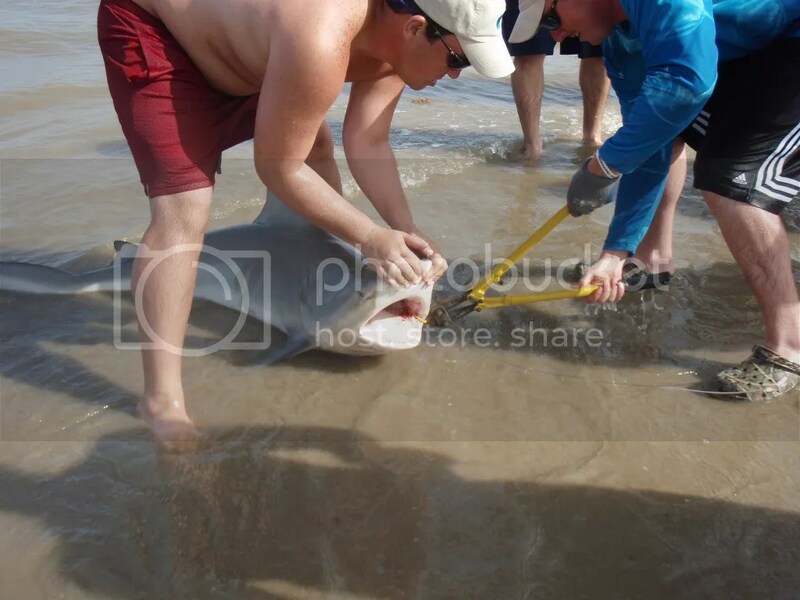 The shark had been attached to the weight and cut off line for about an hour now and was exhausted. When we finally pulled her on the beach, Chris came running in and without saying anything he jumped on the sharks back, opens her mouth, and starts unhooking her. He was just man-handling it with his hand close to its mouth. I let Chris know I have seen this on YouTube and it never works out! We needed to use the bolt cutters to get the hook out. Josh ran over with the bolt cutters and they unhooked her all in the blink of the eye. 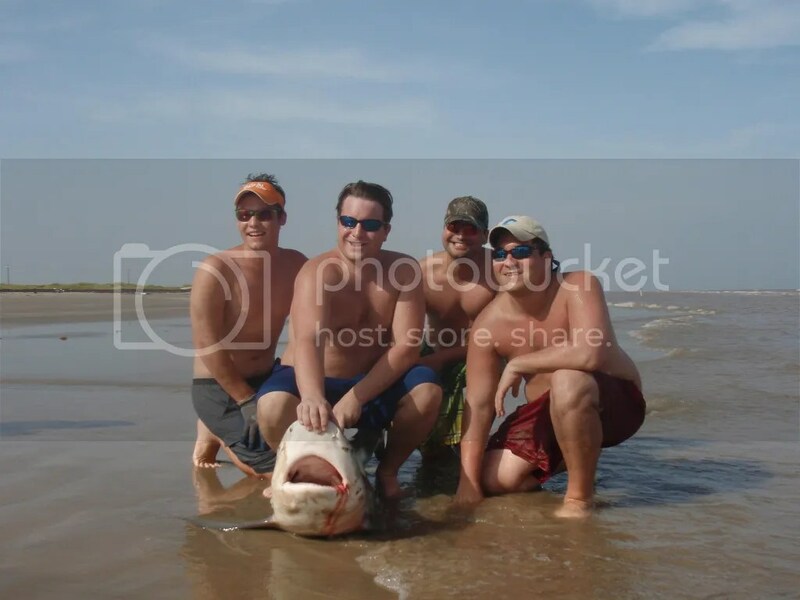 We take just a few pictures, because we knew that this shark was in bad shape and needed to get into the water quickly. The shark measured out at 5’5″. We had it out of the water a total of 2 minutes before Chris brought her out past the first sand bar and started reviving her. It didn’t look good. She wasn’t swimming and didn’t look like she was trying. Just when it seemed like she wouldn’t make it she gave a good kick with her tail. He let her go and for a second nothing not even a tail whip, but then she starts to swim and doesn’t stop. As we watch the fish swim off we all begin to cheer. There is no better feeling than releasing one of these creatures unharmed. We all would have been devastated if we weren’t able to revive the shark. After that catch, all our frustration and thoughts of giving up for the weekend were gone. 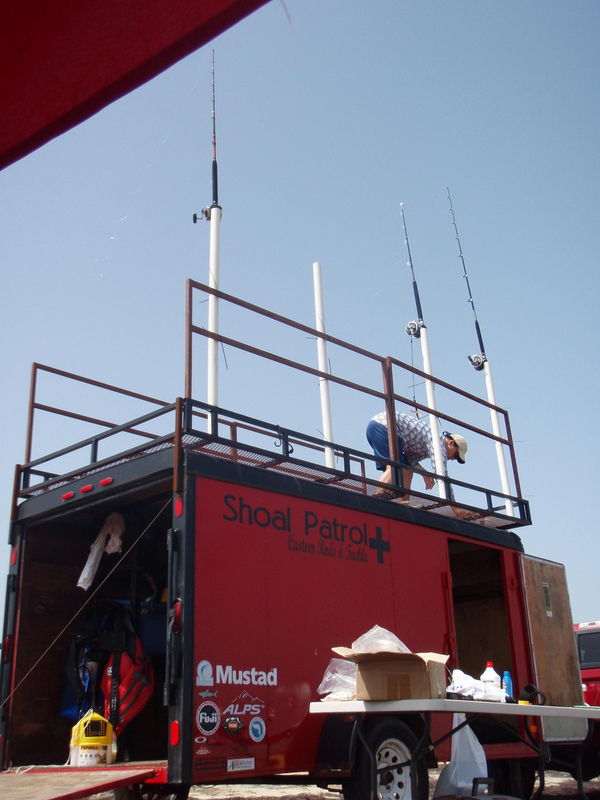 We quickly re-rigged and re-baited all of our rods. If the sharks were in, we wanted to catch as many as we could before night fall. We rigged up some more of the small stingrays from the night before and began paddling. This is where our bad luck sank in. About 5 minutes after each drop the lines would get cut. We had no idea what was doing it, but we lost 3 lines back to back. Could it be Spanish mackerel or small sharks in the surf biting through our line? Were we rubbing on a sand bar? Was the people next to us’ tackle cutting us off? We may never know. Well after losing about $50 of tackle we decided to finally close up shop for the weekend. Overall we had a great trip. 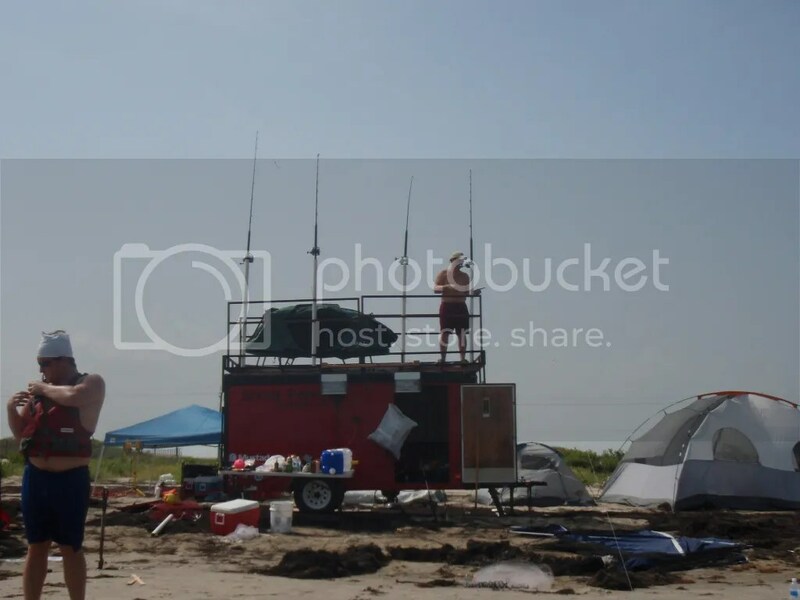 Camping on the beach is always an experience. We met some great people and made some great memories. We came back to the mainland with some cuts, bruises, mosquito bites, and some great stories. Hopefully we will be out there again soon. I can feel that we are getting closer to the big shark that we have all been dreaming about.